Stewart, Tabori, & Chang, 9781584798545, 240pp. 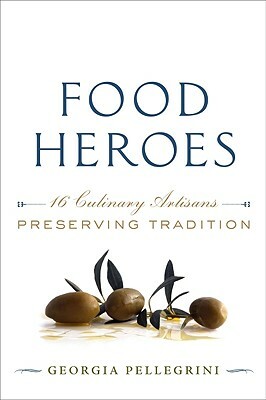 In Food Heroes, Georgia Pellegrini introduces readers to the lively stories of artisanal food devotees such as New York mushroom forager Marion Burroughs, French fig collector Francis Honore, fish missionary Jon Rowley in Washington State, and Ugo Buzzio in New York City, one of the last makers of traditional dry-cured sausages in the United States. Filled with colorful anecdotes, photographs, and recipes, this book offers an accessible introduction to the artisanal food movement, and vicarious living for armchair travelers, food lovers, and others who might won-der what it would be like to drop everything and start an olive farm, or who yearn to make and sell their own clotted cream butter. Thirty-two fantastic recipes follow the profiles, and encourage readers to find their own local suppliers. Georgia Pellegrini's passion for artisanal foods began when she was a child growing up in the Hudson Valley, where her family raised chickens and honeybees, and where the notion of local and sustainable was a daily practice. She attended Wellesley and Harvard and spent a brief stint on Wall Street before attending the French Culinary Institute in New York. Pellegrini has worked in two of New York's most esteemed restaurants-Gramercy Tavern and Blue Hill at Stone Barns-as well as in one of the premier restaurants in France, La Chassagnette. She currently roams the world, tasting good food and meeting the good people who make it--and writing about them on her popular blog: www.georgiapellegrini.com.